CardMonkey's Paper Jungle: Winner - One for the Little Guy! Two of Sadie and Morgan's puppies, sharing love with me. ﻿ Sadie and Morgan helped pick the winner for my blog candy for the DOG GONE FUN BLOG HOP. Don't ask how they helped ... just know they did. Ok, I'll tell you. They're personal friends with Randy of www.random.org. They sat at my computer and counted the entries, double checked to make sure each was a follower ... and turned to Randy. 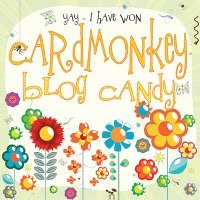 The winner is: ALISHA of www.scrappin-happens.blogspot.com. I contacted Alisha, and gave her the opportunity to pick any gift card she'd like. I love that she told me that instead of PetSmart, she frequents a small, local shop for her pet supplies. I like her logic to support the little guy! She chose a craft supplier for her gift card. Alisha, it will go right out to you!